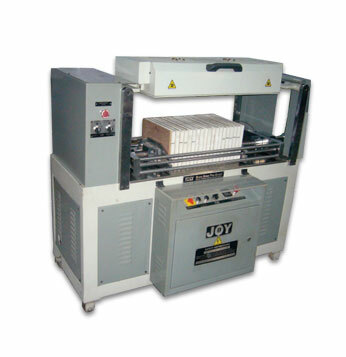 Book Spine Pre-Gluer equipped with Hot Air IR Dryer, is the most economical system for preparation of Book-Blocks suitable for Soft or Hard Case Binding by pre-gluing and drying of section-sewn, pre-smashed and nipped signatures. The process ensures that the Book-Blocks maintain its rectangular shape, which is free from extreme gradients in the folded sewn area. The section - sewn signatures / Book-blocks are held under set pressure with spine resting on the flat surface to ensure rightangle reference of the spine in relation to the height of the book. The books upto a maximum pile size of 710mm can be processed at a time with pile under hydraulic pressure ranging from 1000- 1500kgs. The pile is hydraulically raised for turning the same to 180 with Spine-section exposed. Apply Glue with the help of a brush or sponge, a very thin layer of Glue/Adhesive (preferably flexible, non-swelling Synthetic such as polyvinyl or Animal/Jelly Glue etc. is recommended). Ensure that the amount of Glue applied to the Spine should be just adequate to sufficiently seal the adjoining signatures. The Dryer Unit equipped with Quartz IR Heaters and High Speed fans is brought over the Book Spine Area by sliding the Unit towards operating side. The Adhesive is dried within 2-3 minutes. The Dryer Unit is pushed back to its reset position on completion of the set-time. Book Spine Pre-Gluer Press is a neat cuboid of a machine sturdily built for processing Book-blocks economically with space / power saving and simple to operate for consistent quality.